The Moka pot is a regular coffee maker that can handle everything from a traditional brew to espresso. This interesting – and fairly inexpensive – invention is a useful to way for an espresso lover to enjoy a cup of their favorite drink without breaking the bank with an expensive espresso machine. The Moka pot is just one of the many solutions to the question of how to make espresso with a regular coffee maker. All that you need is a Moka pot, some espresso beans, water, and a mug. That first step? Choosing the coffee beans and grinding them until they are fine enough to work properly in the Moka pot. Usually, espresso beans are labeled as such in the coffee aisle of the grocery store or in the shops of many smaller coffee manufacturers. However, you can use any dark roast beans for this purpose, as long as they are ground right. If you don’t have a coffee bean grinder at home, then this is perfect time to invest in a small one, since commercially ground coffees may be too coarse for a Moka pot. The next step involves filling the Moka pot. 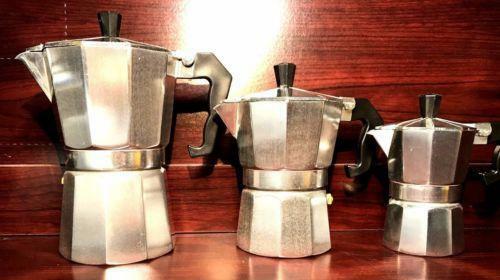 A Moka pot is an Italian invention. It’s a small, 8-sided metal pot that goes on top of a stove. You add coffee grounds and water to it, then sit back and relax while the machine does the rest. The first component that you’ll encounter is the bottom section where the water goes. (For the record, the Moka pot splits in half.) This section is filled with hot water, and then the grounds are placed into the filter basket. This section sits in the water. You’ll need about 22 grams of coffee grounds, but won’t need to worry about measuring the water, since the device only holds the perfect amount. Before you can reach a solution, you need to finish assembling your Moka pot. You’ll want to carefully screw on the top section of the device, which has a spout and a handle, onto the bottom part, taking caution so as not to get burned. Once your Moka pot is fully assembled, place it on the stove over medium heat. The water will boil, which pushes it up through the coffee grounds and into the spouted section. Once it’s done hissing, you can pour yourself an espresso. This is how to make espresso with a Moka pot. These devices are relatively inexpensive and extremely useful, especially for espresso lovers who don’t have the space or the bank account for a full-sized espresso machine.